It seems like the entire world has been hit with “AI-fever.” Not all that surprising considering that by 2030, it’s expected that AI will provide a $15.7 trillion dollar boost to GDP worldwide. To put that figure into perspective, that’s roughly 13X Australia’s GDP. 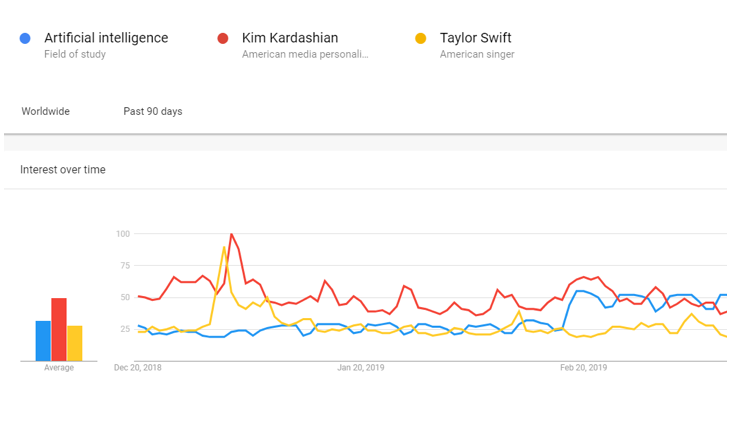 In fact, AI is such a hot term that Google reports more interest in the term “Artificial Intelligence” than in celebrities like Kim Kardashian and Taylor Swift! There’s no question that AI is a complicated subject, based in computer science and data. Some people are leaping to applications like smart assistants and bots rather than taking a step back to understand the fundamentals. Many are wondering if AI is something they need to care about. It’s a meaty and exciting topic, so I’m going to take this blog post to boil down some essentials in a 3-minute read that will hopefully leave you with a sense of confidence around the subject and what it means to you and your frontline training. Regardless of the jarring headlines claiming robots will take our jobs, or the clever AI-infused marketing you’re likely being bombarded with, I’d like to point out that you’ve been living a life supported by AI for quite a while now. In fact, it’s been around for decades—I can even vividly recall the day when IBM’s Deep Blue (essentially an early form of AI) became the first “machine” to win a chess game against reigning world champion, Garry Kasparov in 1996. Today, you’ll find AI in some form behind an ever-growing assortment of your daily experiences – from magically advising you right before you leave the office that your trip home is going to take 7 minutes longer than usual, to sending you personalized playlists on apps like Spotify, to the traffic lights you pass through during your commute. All are powered by some form of AI. There truly isn’t any industry or facet of our life that AI hasn’t touched, or won’t in the next 5-10 years. But sometimes the AI doesn’t get it right. For example, I almost always find shows I have no interest in ever watching (No, Netflix, for the 100th time I don’t want to watch The Boss Baby!) and that’s because AI is only as good as the data set feeding it. Data is the most critical piece of the AI equation and if you’re going to start peeling back the onion on AI, understanding the data you’ll need to fuel it is the most important place to start. Here’s the thing about AI: when you take the time to strip away the technical nuts and bolts behind it, AI’s value is no different than any other technology introduced over the past four hundred years, including Johannes Gutenberg’s printing press, the calculator and the internet. These technologies were all developed to help us essentially scale human production—to mass produce books, expedite answers to complex mathematical calculations and crowdsource the world’s knowledge making it accessible from anywhere. But moving beyond just scale is where AI’s true benefit is realized. It’s about adding an equal dose of personalization. Traditionally, scale and personalization have been impossible to achieve at the same time. AI changes that paradigm, which is why many are referring to AI as the 4th industrial revolution. Personalization at scale has been an elusive goal for those involved in learning since the launch of the very first classroom. I’m sure many of you reading this post are no stranger to the challenge of delivering a personalized training experience that can be scaled across large audiences—especially when you throw stagnant budgets into the mix. The internet helped, but it only took us the first step. This is why AI has become even more popular within the field of learning, with industry reports covering it broadly as a trending topic. Josh Bersin’s 2019 HR Technology Market Report alone contains over sixty references to AI (yes, I counted). AI is everywhere and there are many great reasons why it’s not going away. The good news is that you don’t have to understand exactly how AI works to take advantage of the value it brings to training your frontline employees. What AI is right for you? With AI technology now being widely available (heck, you can even get free complex open-source AI models) there are a bunch of simple applications of AI designed to make corporate training more effective. While most do provide legitimate business value, it’s important to start with the fundamental learning experience before you consider the “nice-to-haves.” In other words, don’t look at buying blinds for your house until you actually have a house. Below is something we leverage in our work with customers that helps contextualize the various AI applications that you’re hearing about. The “Forming” quadrant includes AI applications which are relatively new where both market adoption and business value is low at this point in time. In contrast, the “Growing” quadrant includes AI applications that are more mature and, for the most part, have proven business value in the field and are now being adopted in practice at a high rate. And because the AI space is changing so quickly, you can be sure that we will continuously revisit this framework as it rapidly evolves over the next 12-18 months. If you’re not quite sure what the difference is between a chatbot or adaptive learning, don’t worry—below is a handy chart with some definitions and business value context for the most popular applications in workplace learning today. Adaptive Learning Uses AI to continually measure an employee’s knowledge and on-the-job behaviors along with the relative impact on a specific business KPI. Then adapts training to each employee to fill gaps with targeted training in areas that will generate the greatest business impact. High: Adaptive learning AI is a fundamental starting point as it’s part of the core learning experience and therefore provides the single biggest opportunity for real business value. Adaptive AI grows and flexes with the employee as they change throughout their time in a role, not just during training or when they go looking for content. Value is derived from aligning personal knowledge gaps with business goals. ROI/Impact Measurement Uses AI and big learning data to continually measure the impact of training on the business, while providing recommendations to users, frontline managers and administrators on specific areas for improvement when meeting a business KPI. High: Provides the critical insight to C-level audiences on the value of training. Also helps the organization know what training is working so they can be proactive about fixing experiences that are not having an impact—before problems arise. Chatbots/Intelligent Search Imitates human dialogue to have conversations with employees. Essentially, it’s an assistant that communicates targeted information based on what the employee is looking for (think Amazon Alexa). Medium: A cool nice-to-have that carries business value for a variety of use cases including in-the-workflow performance support. Chatbots are essentially the evolution of intelligent search, providing a more human experience. They are limited to addressing predictable problems (i.e. “I can’t find that information” isn’t an acceptable response for timely issues so there must be a backup plan). Content Generators Scans content and uses natural language processing to create net new content. For example, can dynamically sift through a 2- page document or 60-minute video and convert it into a 1-page summary. Medium: Although this is emerging, it has the opportunity to provide tremendous business value by saving administrators time creating high-impact training content. Virtual coach Senses a user’s progress based on struggle, pace, learning patterns and success, and then encourages through personal messages. Low: Provides coaching recommendations and identifies gaps. This is essentially a human-like coach layered onto adaptive learning AI. Content Recommendations Recommends modules and articles to users based on consumption patterns of users with a similar profile. Low: Can help users focus their attention on training content that others have found useful. However, if done incorrectly, users can be overwhelmed with the volume of curated content (i.e. there are too many shows recommended to me on Netflix so where do I start?). Another limitation is that it only makes recommendations based on consumption patterns of others and doesn’t consider whether the content has demonstrated tangible impact to the business in the past. Content Auto-Tagging Tags content with keywords to make it easier for administrators, or other users in the system, to find in the future. Low: This is essentially a smarter version of meta-tagging. It holds promise, but auto Content Generators take it a step forward in terms of business value. Hopefully now you have a better understanding of the nuances between different types of AI in the learning space. Here are a few ways you can get started with mapping out how AI could (and should) fit into training delivery to your frontline. Completion rates and test scores don’t provide the type of data that AI requires to do its magic. You’ll need to look at your architecture and data strategy first and determine what pieces of data you have access to across the business—including your learning data—that can be leveraged to feed AI. Then consider which AI applications may be feasible to support performance/learning. When you’re building a house, you need a solid foundation in place before you start adding windows. The most meaningful AI-powered training will deeply personalize the learning experience for employees and allow you to measure what’s long been unmeasurable—the true impact of training on bottom-line results. The Axonify Microlearning Platform was built on a foundation of smarter AI from the very beginning. It’s AI with purpose and it’s what all organizations should be striving for as their ultimate destination. There are a variety of AI applications, some are designed to augment the learning experience for learners, while others are targeted at helping administrators. After you’ve introduced things like adaptive learning as a foundation, then you’re ready to look at layering on the other cool stuff based on value you need to create for specific user groups and audiences. It’s hard to do an epic topic like AI in learning justice in a single blog post. So we’ll be sharing many more thoughts, tips and strategies around this massively important subject over the weeks and months to come. I’d encourage you to subscribe to our blog so you can stay in the conversation. PS: Until the next post, if you’re into classical music, Google recently celebrated world-renowned German composer and musician, Johann Sebastian Bach, with a first ever AI-powered Doodle. It allows you to compose a two measure melody and through the power of AI, spits out the melody in Bach’s signature style –it’s pretty cool and I encourage you to try it! Shabbir is a savvy product marketer who’s been tied to some of the most innovative technologies impacting our daily lives. When he’s not architecting product and market strategies, you’ll find him at home having an ice cream with his 3-year-old daughter and newborn son.